Time to get your bike tuned up, if you haven't already done so, to get ready to join us for the Discovery Bike Rides we're planning to organize in Maple Ridge and Pitt Meadows this year! We are hoping that with these Discovery Bike Rides we can help you discover neighbourhoods that you haven't visited, and routes that you may not have considered before, as well as to highlight local businesses that are doing their share to create a better community for us all. Cycling is a great, healthy and fun way to get around in Maple Ridge and Pitt Meadows, whether it's for shopping, to go to school or work, visit friends, to pedal over to a local farm to get your organic, free range eggs, or whatever. For each Discovery Ride we'll have some interesting and/or tasteful stops planned. We're sure that there are lots of local farms and other businesses, restaurants, coffee shops and perhaps some picnic sites that many of us don't know about yet. We have some ideas, but we also hope that you have some suggestions! We would like to pick destinations in both Maple Ridge and Pitt Meadows, and we can be flexible with our start and finish points. Preferably we should finish at some type of eatery, coffee shop or ice cream parlour, because the "après-vélo" is part of the fun! Our first Discovery Ride will be on Saturday, April 9 at 10:00 am. We'll be leaving from BIG FEAST BISTRO, 11920 227th street in Maple Ridge. Some of you who participated with our bike ride last year introducing part of the "123 Route" may have tried some of the finger licking delicacies by Chef Mike. I've got my favourites, but then, so far everything I've tried at Big Feast is my favourite, so I'll keep trying new items on the menu. Check out Big Feast's website: http://www.bigfeast.ca/. Big Feast is a very community-, and environmentally friendly business. Mike tries to buy his ingredients locally whenever he can and is big on re-using and recycling. These initiatives are certainly worthy of our support! But, let's not forget about what's actually the most important part of the event: the ride itself. 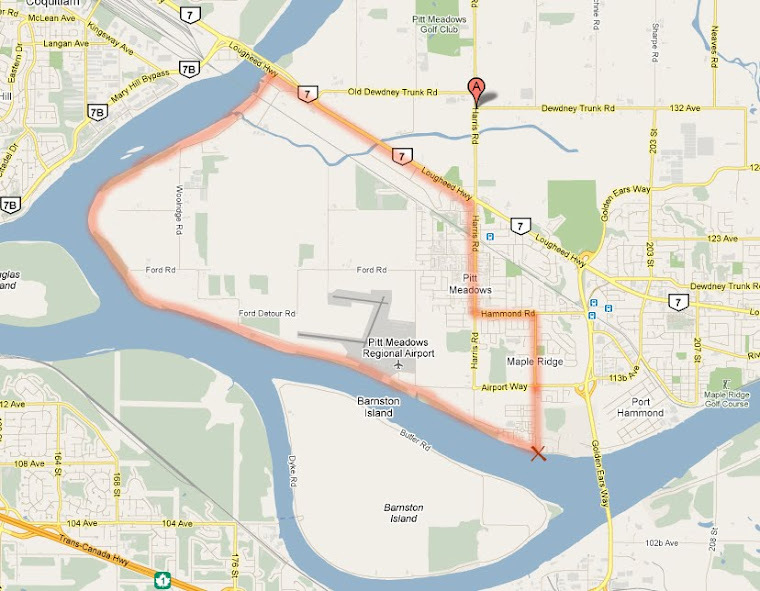 You can find the approximate route at the following link: http://www.mapmyride.com/routes/fullscreen/30759128/. This route will be close to 20 kms. With some hills. We'll be taking it easy, so don't worry if you have to get off your bike and walk up a hill if you're not in the greatest shape or if you're just a little tired. It's supposed to be enjoyable, and we're not in a rush! From Rainforest Design it's only a short ride to KANAKA CREEK COFFEE, a nice neighbourhood coffee shop, owned and operated by long-time Maple Ridge residents, that's worth a visit. They offer quite a nice variety of coffee, tea and other drinks, including healthy fruit smoothies if that's what you're looking for. Their website: http://www.kanakacreekcoffee.com/. Note that on Wednesdays between 4 and 8 pm there's live music! We should be back at Big Feast Bistro around lunch time. It's up to you if you want to stay for lunch or head home. Please note that we will need to ask all participants to sign a waiver at the start of the ride. Please arrive 10 to 15 minutes early to allow us to get the waivers signed. Kids under 18 are welcome to participate, however they will need to be accompanied by an adult, who will be responsible for their safety. Please ensure that any participating children are physically able to complete the ride. On our rides we will try to avoid busier roads as much as we can, however sometimes we may have to ride on a short stretch of a somewhat busier road to connect to quieter streets. These Discovery Rides are free for participants. However, we will happily accept donations, which will help us to promote cycling in various ways in our communities. Finally, just a reminder: cyclists are by law required to ride single file on roads, and also to wear helmets. Please send an e-mail to Jackie at jchow23708@yahoo.ca if you're planning to participate. Also, please let us know if you have any suggestions as to destinations for our Discovery Rides. PaddyAnne, do you know about the Vancouver Bicycling Meetup Group? Check out their website: www.meetup.com/cyclists. They organize rides throughout the Metro Vancouver area, and they will also be posting our rides in the future. Are you on our e-mail list? If not, let me know and I'll add you.